Beginning September 2018, international administrations of ACT test will be conducted in a computer based test (CBT) format. The test will remain the same as the paper based test conducted in the US, but it will be delivered via the computer. ACT has released a free computer based test for international students. 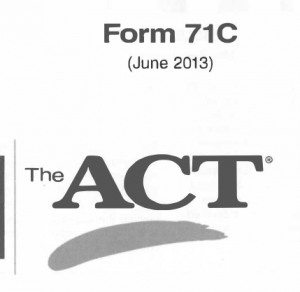 This test is identical to the 2013 June ACT test (Form 71C). Students in the US can also use this for free practice. Great help for students!!! Do you have an online vetsion of Oct 2018 test? The October ACT test is not released by ACT and you will not find of copy of the test anywhere. !Do you have an online vetsion of Oct 2018 test?